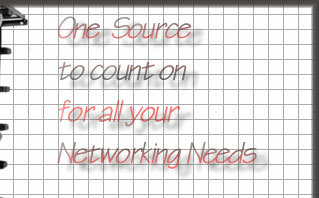 Companies can realize multiple benefits from the correct networking solution. If you've ever asked, "what network is best for my business" the options are confusing. Will a LAN, WAN or Wireless be the best? The options are many. Is it ready for the future and cost-effective to support your company's growth? Networking decisions you make today will affect your operational and financial efficiencies into the future. CompuSource will assist you in determining an optimal network infrastructure for your company with the speed, convenience and security you need. We ensure that your network infrastructure will be reliable, with the flexibility of growth and the opportunity to integrate new and existing technologies. When computers and applications are changed in a complex network, the network's ability to meet performance standards can be challenged. A detailed examination of the configuration components, can uncover these challenges before they cause business problems. Whether an entirely new network is being contemplated or changes are needed in an existing network, we design and build crafted solutions using industry standard best practices. Because these solutions are delivered fully documented, future design modifications to the network are already in progress.